With the introduction of Google places/Google local and personalisation, local businesses cannot afford to miss out on searches. Whatever offline business you are in, prospective customers are searching for you right now. There are dozens of free listings sites that local businesses can register their details with. Even if you don’t own a website. #Quick Tip. A simple trick here is to write your full business name and address into a notepad file. Then every time you see a potential listing opportunity, pop open the notepad file and paste in your details. This serves two purposes, firstly it is more convenient to write once and copy/paste forever more, secondly and most important is your listing will be seen by Google as ‘constant’ meaning that you will be instantly seen by their ‘bot’s as one and the same company and rank you higher. If you do have a website, make sure that this same address detail is in the footer of your pages too. All this gives you great ‘Google juice’ and ultimately more potential customers finding you online through natural organic SEO. The Website theme used to create this site is the same theme I promote to local businesses who want to rank well for local searches. Website designers are often more interested in the ‘look’ of a website and fail to work on the real issues of functionality and generating new business for their client. Websites are like engines that power many parts of your internet machine. Sure, it’s good to keep your engine polished, but not at the expense of performance and ongoing maintenance. See the below features as ‘engine specifications’ next time you buy a website. 1. Above the crease slider area scrolls through your images/samples immediately. 2. Professional logo design and incorporation. 3. 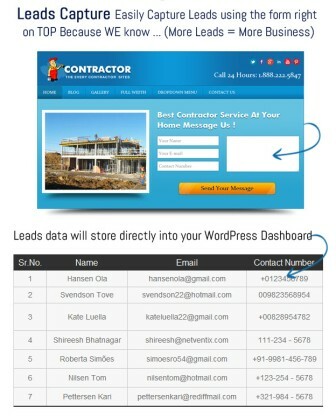 Leads capture sends email messages direct to your in-box. 5. Social network button featured area links directly to your external pages. 6. 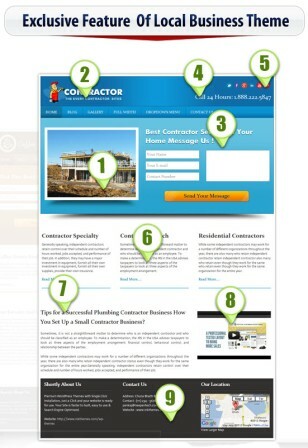 Three extendable feature areas for listing your services. 7. Describe your business and tell people about your products and history. 8. Embed your promo video here to drive a positive ‘call to action’ or include a video testimonial. 9. Flexible widgetized footer area for all your contact details/maps and mailing list capture forms. I’ve hope you’ve enjoyed this Local Business Website overview and look forward to hearing your comments and questions.